Mid-Winter Bluegrass, here we come! Yes, it is, once again, time for Ken Seaman’s much-anticipated Mid-Winter Bluegrass Festival, starting today, February 15, and running through Sunday the 17th at the beautiful, not-downtown Northglenn Ramada Plaza & Convention Center at I-25 & 120th Avenue, north of Denver. Following an energetic 4th of July show in Salida, Trout Steak Revival hosted a Saturday night scorcher at The Mish filled with an eclectic mix of musicians. With apologies to Paul Simon, there must be 50 ways to break up a band… or more: moving away, especially prevalent in college towns; changing life circumstances, like having children; medical issues—one’s own, or a family member’s; these are all common reasons for parting ways. And, yes, I am writing this because my band is now broken up (we’re still friends). But out of the ashes, new life appears. I’m working on establishing a new band, and I have a new set of characters (figuratively and literally) to deal with. It’s always interesting to find out how others learn, musically-speaking. I now have two extremes: those with classical music training and those with absolutely no musical training. And what is truly amazing to me is that this group of musicians can actually play together and sound great! Bluegrass is like that: it brings folks together. But there are issues to be overcome, and the most common have to do with timing. A good musician who has learned everything he (or she) knows “by ear” is usually mystified when classically trained musicians talk about timing, or phrasing, using the language of written music. So, in hopes of providing new understanding, or at least clarification, here is a brief summary of terminology. You’ve probably heard the term beat. A beat is the basic unit of rhythm, the underlying steady pulse of the song, the part that makes you tap your feet. Rhythm is a repeating sequence of stressed and unstressed beats (sometimes called “strong” and “weak”), divided into “bars” organized by “time signature” and tempo indications (more on this later). This rhythm is usually embedded in the bluegrass guitar’s strum (affectionately verbalized as “boom-chick” where “boom” denotes the plucking of a bass note on the down-beat, while “chick” denotes the strum of a chord on the up-beat). Yes, “the beat” can be subdivided into a downbeat and an upbeat, and it’s that rocking, back-and-forth, repetitive gesture that IS the beat. When we talk of “getting in the groove,” that’s when all the musicians in a group are feeling the exact same rhythmic timing, with no tension between individuals having slightly “off” timing. A group of beats are collected into what we like to call a bar (we just like that word). Actually, it’s because the bar line (or barline) is a vertical line across a printed “music staff” (the group of horizontal lines that denote frequencies) so that where a note is placed on the staff tells us what note, or frequency, the player should play (i.e., an F note). When you “read” music, you are “reading” these notes on a staff. Just like beats are grouped into bars, the bars themselves are grouped into phrases. When someone tells you that this song has “an A part and a B part,” he’s telling you there are distinctly different musical phrasings in different parts of the song. And just to confuse matters a little more, the A and B parts, themselves, are usually comprised of multiple phrases. Next: whether we know it or not, music is all constructed on the framework of a “time signature.” We all understand it intuitively, when someone says, “This is waltz time,” meaning 3/4 time (pronounced “three-four time”) as opposed to the more common 4/4 time: there are three beats “to a bar” (or three beats “to a measure”) rather than four. In jazz, it’s fairly common to have unusual time signatures (like Brubeck’s “Take Five,” using 5/4 time) and for time signatures (which are a printed indicator of the beats-per-bar, placed at the beginning of the staff) to change, even numerous times, in the composition of a single musical piece. In bluegrass, that’s almost unheard of; once we start a rhythm we tend to stay with that rhythm (think continuously-rolling banjo). Still, there are always exceptions. The full explanation of the 3/4 time signature is “three beats to a bar, and the quarter note gets the beat,” which only makes sense to those who actually read music scores. But the idea is relatively easy to grasp: your timing repeats 123/123 instead of 1234/1234. Six/eight time is just a high-energy 3/4 time (think “Irish Washer Woman”), where the eighth note gets the beat, rather than the quarter note. It’s still based on threes: 123456/123456, which could also be 123/456/123/456. But this brings us back to the term “phrase,” because a minimum complete phrase in 6/8 time requires a full six beats, while a minimum complete phrase in 3/4 time can be just three beats. Different songs have differing lengths of complete phrases, but a complete phrase in 4/4 time is usually eight beats (although it can be 16, or four… but always an integer multiple of the basic four beats/bar). The lyrics in vocal music can really help you understand phrasing. The natural punctuation of the sentence structure will often determine the phrase: periods, commas, and semi-colons usually correspond with the phasing. However, without lyrics it can sometimes be difficult to determine a phrase, because phrases can have smaller phrases (musical ideas) embedding into them. So all of these words are a bit nebulous, as they are applied to music. But that’s because we don’t want rules to get in the way of invention! Isn’t it incredible what we can do with only an octave worth of notes? How many 1-4-5 songs do you know? Isn’t that amazing? We have rules, but not too many and —sometimes— we even break them on purpose. Like “The Clinch Mountain Backstep,” where the composer just said, look I can add a beat if I want to! Or “Rebecca,” where “the trick” to understanding the song is to know that every time you go to the four chord, it only gets three beats (it’s a 4/4 song) —except for the first four chord in the beginning phase, where it only gets one beat. These are all technical issues that we address in order to play music that an audience (or “an audient” if there’s only one listener) will enjoy and come back for more. Music is mostly (my opinion) about eliciting emotions from the players (who need to feel it) as well as the listening audience (whether that’s your neighbors on the porch or a auditorium filled with thousands of people). Getting emotion into your musical delivery is something you need to continuously develop over time, as your technical skills continue to improve. Now, I don’t want anyone to think that I “believe” classically trained musicians are necessarily “better” than those who have learned by ear. In fact, the thing musicians want most is to be able to effortlessly translate, with their fingers, the notes they hear in their heads, and those who learn by ear are actually closer to the ability to do that. But there are excellent musicians who have learned their craft both ways! Of course, the best of all possible worlds is to do both: play by ear, but also have classical training so you understand musical technicalities. But there is no reason to pre-judge anyone on how they learned—or on any measure of ability other than actual performance. I’m just trying to help you improve your performance. This year I missed the Mid-Winter Bluegrass Festival, and you know it would take something extraordinary for me to miss that! Yep, flu. Like so many others in Colorado and around the world, this flu season got to me with an exceptionally debilitating form of the annual infection. As I was sinking emotionally and physically, coming down with the flu, I along with the thousands of other convention-goers attended the event’s main banquet where a musician—a solitary troubadour, entertained us. Listed in the meeting agenda as “Joe Stoddard, Entertainer,” it was a surprise to me when he walked onto the stage with his guitar. I thought “entertainer” would be different than “musician.” But I settled in, fighting nausea and the urge to flee, in the hopes that I could learn something from this musical “entertainer,” or simply enjoy his music. He had white hair, and a pedigree read by the event’s MC, as Joe stood off to the side during his introduction, of having played with a number of California bands dating back into the ‘60s, that he wrote some songs for. So I figured that it would be natural for him to have evolved into a solo singer-songwriter act. He was addressing an audience pre-conditioned with liberal applications of free liquor (always good for a live performing act), but we were totally unprepared for what transpired. This “entertainer” broke through my growing delirium to elicit an intense reaction from me, and everyone else in the audience. Much to my surprise, he evoked one of humanity’s most powerful emotional responses: laughter! Because he was not just a musician, but also a stand-up comic of a musician! On his first number, he foreshadowed the remainder of his show by talking directly to the audience as he strummed his guitar creating “background noise.” He asked what genre of music folks wanted him to play, and his well-rehearsed solution to the inevitable cacophony of audience responses was to claim a split between country music and rock & roll, with maybe a few sprinkles of folk thrown in. So he went to work. I can’t remember or describe everything he did, but a few of the more memorable moments stand out. He did mention that almost all love songs from the ‘50s used the same 4-chord progression (think “Oh, Donna”), which he proceeded to demonstrate by playing portions of at least half a dozen of them. At the end of that medley, was some song about being down and out, or getting knocked down, or something (I don’t remember). What I vividly remember is his taking a pratfall with his guitar with me only being able to see a foot and leg sticking up from the stage floor! So now you should be able to imagine my surprise when I first realized that he was not just a musician, but a stand-up comic as well. He combined slapstick humor with music and more cerebral humor. I think the high point was when he said he could do an amazing imitation of a musician from the ‘60s, but only if he stuffed his mouth full of tissues first. And he did stuff half a dozen tissues into his mouth one by one as we, the audience watched. So whom did he imitate? Bob Dylan, of course. After his show, as the audience was filing out a single open door from the banquet hall, I happened to pass Joe as he was collecting his electronic gear from the back of the room. I told him that I had called out “bluegrass” in response to his initial question about musical genres, but he obviously didn’t hear me. His reply, “Well, that would have been interesti...” was cut off by someone behind me in the line filing past, grabbing his attention with a compliment. So I guess I’ll never know if he could have pulled off his on-stage humor using bluegrass as his musical context. But, as a result of this experience, I offer this as yet another option for aspiring musicians: maybe you want to become a musical stand-up comedian. As of 2018, the bluegrass jam at Avogadro’s Number, 605 S. Mason Street in Fort Collins, will continue to happen every Wednesday night, but now it is starting at 7:00 pm (or earlier, if you want to organize a group to meet earlier). Mason Street Bluegrass Band will no longer play on stage before the jam starts, so grab your early-to-bed friends and get down there early to pick and grin! Mason Street will be playing a regular night show at 8:00 p.m. every second Friday of each month; come out and support bluegrass musicians! The Colorado bluegrass community will enjoy a rare treat when Lyons local Sally Van Meter takes the stage to headline the February 24 "Bluegrass at the Audi" concert. Sally is widely known for her slide talent on the steel and resonator guitars, and for her expertise in the recording studio. She earned a GRAMMY for her work on The Great Dobro Sessions and can boast quite an impressive resume as a performer, studio musician and producer. She’s also known as quite a private, humble person, and one who generally doesn’t seek the limelight for herself. We certainly feel privileged to host her at the Audi. In this electronic age everything, it seems, is digital. Bluegrass instruments are a wonderful exception to that particular rule, allowing the nuanced resonances of “wooden box” amplification (pioneered centuries ago) to produce the sweet sounds we have been conditioned to expect from our wood and metal instruments. We have given a nod to electrification by adding microphones, in order to pick up the subtleties of natural over-tones produced by vibrating strings and less-strenuously project that music to a listening audience. And what a godsend it is to be able to vocally project throughout an auditorium, or an outdoor field full of people, without having to over-strain our vocal chords: ain’t mics wonderful? With digitalization comes precision: for example, in the Olympic Games, contests between athletes can be decided by one-hundredths of a second! But in a musical presentation, on the other hand, absolute timing accuracy is not necessarily a good thing: it can, in fact, make a musical composition come off as overly machine-like and un-human. But not keeping a reasonably regular rhythm is at least equally disturbing. This question of how to balance repetitive precision with artistic freedom, pitting accuracy against interpretation, has been around for as long as there has been music. Early on (well before the electronic age) there were no “regular” beats available as a reference, so people got creative: they used their own pulse (heart beat rhythm) to judge “regular” timing. This idea of regular timing is especially critical for large groups of musicians attempting to play together. I think that’s why conductors were invented: to force orchestral musicians to share the same beat, as directed by the conductor’s waving wand. But orchestral musicians had to pay close attention to the conductor, because there was no such thing as a “regular” beat—except for short-duration episodes within an overall composition; there were “movements” which varied in all kinds of ways, including rhythmically. By the eighteenth century, composers were using terms like “Andante” (which is Italian for “walking”) to invoke a somewhat shared experience of repetitiveness in order to establish a “proper” timing. Terms like “Tempo di Minuetto” made reference to an established organized dance, where the dance movements, themselves, dictated a rhythm to be shared. If they had comedy back then, I’m sure it would have included the idea of an off-tempo (up-tempo) interpretation of organized dance timing that would have left the poor dancers frazzled (think of Groucho, Larry & Moe sharing conducting responsibilities). So, some progress was being made on the “regular” timing front, but it was all still very subjective. In the age of enlightenment, attempts were made to link rhythm to the movements of a clock. When someone discovered that the length of a pendulum affects the speed of its motion, instrument makers seized upon that new understanding to create the classical clock-like metronome, with a sliding weight on a thin metal bar, so that it will swing back and forth in a regular rhythm dictated by the exact placement of the weight along the length of the bar. Thus, a truly steady beat of “X” beats per minute could be established with accuracy. And now, of course, we have digital metronomes that can churn out a steady rhythm with extreme precision. Which just gets us back to our original dilemma: rhythmic accuracy? Or artistic license? Well, we know that going to either extreme ALL the time is problematic. I do know someone who wants to “get out ahead” of the beat. The problem is that doing that all the time means speeding up! But thinking through that issue made me realize, like many problems, what this problem needs is a solution that doesn’t buy into the “either/or” approach espoused above. The answer is to do both, instead of trying to choose only one, turn an “either/or” into a “both/and” solution. It’s just that “coordination” needs to be added into the equation; you keep a steady beat for some period of time before you vary the rhythm, or jump around, in front of, or behind, the rhythm. And then repeat, or vary your repetition so that it doesn’t seem like repetition. Or... you come up with some idiosyncratic interpretation of how to combine these elements. I think “mixing it up” is a good way to introduce variety—as opposed to just monotonous repetition, or just a-rhythmic/non-rhythmic exuberance—and get to experience them all, within an over-all unifying framework. No, not ALL the time, of course, it’s best to stay away from the extremes. Selections of different combinations of the musical options available to you (or invented by you), all deliberately chosen to coordinate with the emotions being evoked vocally, that’s the trick! And, yes, there are always exceptions to [any] rule. Gary Barker was my partner in bliss and folly, as we pursued a mutual adoration for bluegrass music with our band Loose Cannon Bluegrass. What started around a kitchen table, ended up taking us all over this gorgeous state, and on to Kentucky, where we played at ROMP in honor of Bill Monroe’s 100th birthday. With Gary behind the scenes tirelessly booking, organizing and maintaining a web site, we grew the band over more than 8 years, and had the privilege of working with many talented and generous musicians. 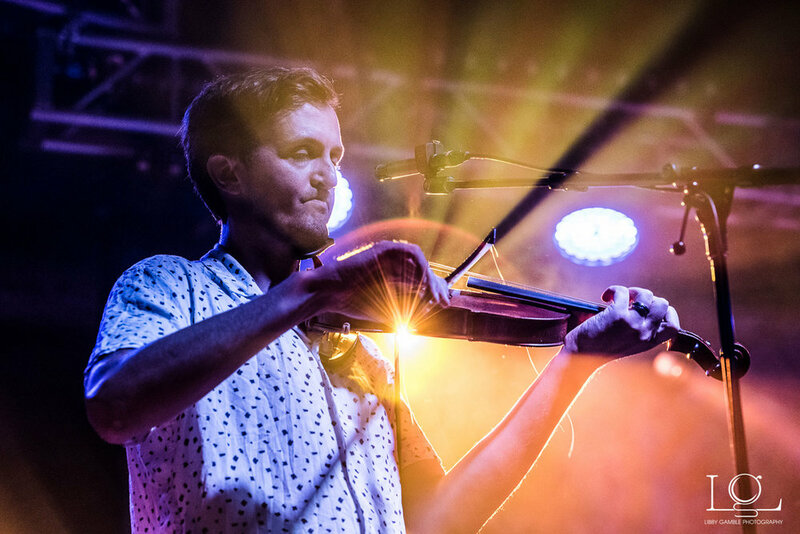 Gary first arrived on the Colorado bluegrass scene in 2004. We all met him at the White Fence Farm Thursday night jam, back in the day. He had retired from teaching and had relocated here from Saginaw, Michigan, with his wife, Jean. They followed their daughter Molly, who was just starting her family. We soon discovered that he was a great Dobro player, and a quick study. We would later learn the full and formidable depth of this remarkable human being. There was not a corner of Gary’s brain that he didn’t fill with knowledge, and then share it with anyone who had the good sense to listen. He wasted not a moment on this Earth, as an educator, scientist, athlete, musician, devoted husband and father. A former Teacher of the Year, he built his own seismometer and regularly kept up with tectonic activity around the globe. Gary could and would give us updates on earth movements that hadn’t yet hit the news. We spent a lot of road time, travelling from gig to gig, and there is a stretch of highway, between Colorado Springs and Cañon City, that will forever remind me of him. He explained the rock formations on either side of the road, and why one was older than the other, by so many million years. Yet another thing he knew off the top of his head. Colorado was a geologic playground for him, with boundless opportunities to learn and explore. Self-effacing, humble, quietly doing the work, while encouraging those around him to shine, that was Gary. He dedicated his life to the betterment of others. He had a great sense of humor, a laugh that seemed to start in his bones, and quirky little habits that would spring out of him when he was particularly happy or excited, like rapidly rubbing his hands together, or raking his picks across the Dobro strings. Family was the world to Gary. Growing up in Middletown, Ohio, he was the baby, behind older siblings Marvin and Mary. He and Marvin had a bond that is only cultivated after a lifetime of fun-loving chicanery. They perfected the art of the “non-joke” which is something that the dismayed listener would have to experience, in order to fully understand. For them, it was a knee-slapping, howling good time. With Gary, we got the gift of the whole Barker clan: Jean, and their daughters Molly and Corrie, granddaughters Audrey, Annika and Layla Jean, as well as sons-in-law Eric and Adjmal. They are the silent heroes in this story. They supported us at our gigs, and were his life, his backbone, his strength, during the grueling months, his inner circle that propped him up when it all seemed too much. They will need time and healing of their own. Gary, my dear friend, we hit the double-jackpot; first for having been born, and again for having known you. Yes, you. See you in the starscape. Watch for updates coming next week. Welcome to the new CBMS Web site. Watch for news beginning next week.